When our babies are tiny, it’s hard to imagine what they’ll look like when they grow up. 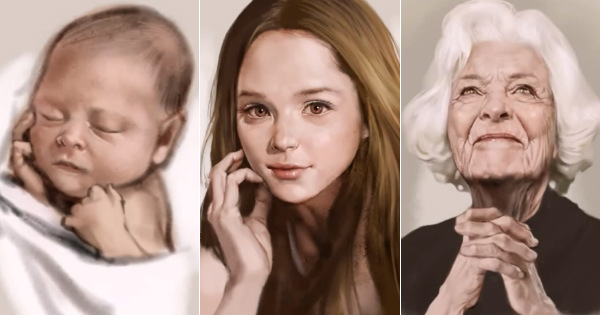 That’s why this time-lapse digital drawing of a baby ageing into an elderly woman is so fascinating. In this clever video, South Korean illustrator Seok Jeong Hyeon, better known as Stone House, draws a baby girl and then continuously edits the picture to show her growing through childhood, adolescence, young adulthood, middle age and old age. He subtly changes her facial features, expressions, skin and hair along the way, just as in real life, until the final poignant image. I found this video incredibly moving – watch her age before your eyes and tell us what you think below.